The Veronica is a sunset blend of garnet gerberas, crimson carnations, hot pink Oriental lilies and a single ruby rose ensconced in lush foliage, wrapped in an impressive bouquet and hand-delivered to the door of your recipient. 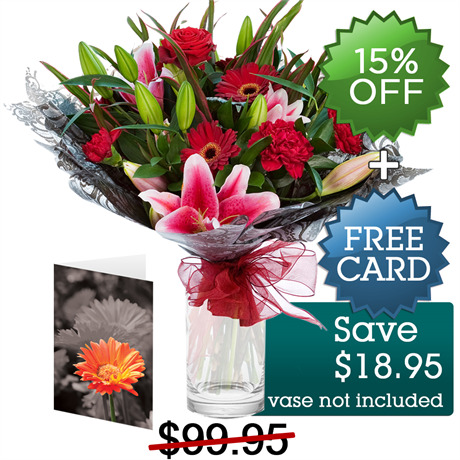 A great bouquet in the hue of energetic red, this gift is perfect for celebrating a birthday, enjoying the whirlwind of romance, or to simply say thank you. This vividly colourful selection of blooms is one of our most popular, and is enhanced with a complimentary premium card. To maximise the impact of your generosity, opt for a keepsake vase or perhaps some delectable chocolates, available from our gift section. Making her the envy of the office is easy with this sensational display of colour and fragrance. Veronica with Card includes a premium card.